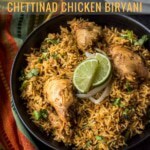 For those who are tired of the same old way of making chicken biryani, you got to try making Chettinad chicken biryani in an Instant Pot. It is flavorful, spicy and oh so satisfying…just like the traditionally made biryani..but with half the effort. 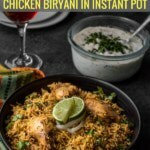 The first time I tried making biryani in an Instant Pot, I kept thinking that there was no way that these pressure cooked biryanis were ever going to live up to the classic preparation. But boy was I wrong! When the shrimp biryani came out so well, I had to try making chicken biryani as well. 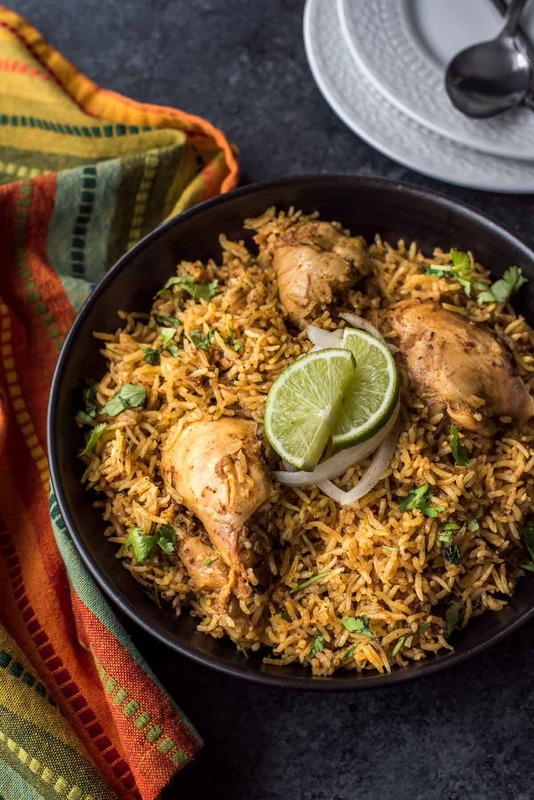 I have been making the same kind of chicken biryani for the past 7-8 years and I could sense the excitement that my family initially had for my biryani fading away. So I decided to switch things up a bit and picked up a packet of Chettinad chicken biryani masala at my local Indian store and I am glad I did. The difference in taste is remarkable and if you like spicy biryani with a bit of tang, then this recipe is for you. 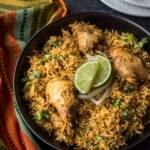 How is Chettinad chicken biryani different from the traditional biryani? Chettinad is an area in Tamilnadu (a state in the southern part of India) and Chettinad cuisine is known for being aromatic and spicy. The biryani masala used in Chettinad chicken biryani is slightly different from the traditional one. It has a few more spices such as star anise, kalpasi (stone flower), Marathi moggu (dried flower pods) etc. than garam masala does. This biryani masala, when combined with coconut milk, adds an interesting touch to this rice dish. For now, I have leveraged store-bought masala powder (Arumai Chettinad biryani masala) but plan to make it at home soon when I can source all the ingredients. Meanwhile, get this Chettinad biryani masala from your local Indian store or online. Adjust salt/chili powder before adding chicken – The last thing you want is a bland tasting biryani. That’s why you need to add salt as well as chili powder a bit more than usual so that when you mix rice with the base curry, your biryani is full of flavor and doesn’t taste bland. That’s why I do a taste test of the gravy before I add chicken and make sure the gravy tastes a bit more salty and spicy than usual. Pay attention to the cooking times for boneless vs bone-in chicken – I typically use boneless chicken thighs for my biryani but if you plan to use bone-in chicken, pressure cook the chicken for 3 minutes (high pressure, followed by quick release) before adding rice. The quantity of Chettinad chicken masala – I used Arumai Chettinad biryani masala and about 4 tablespoons of masala was the perfect quantity for 2 pounds of chicken. If you are using any other brand, start with 2 tablespoons of the biryani masala, mix it well with the yogurt and do a taste test before proceeding to add more. Whisk all the ingredients listed in the marinade section except chicken. Coat the chicken with the prepared marinade and refrigerate it for 30 minutes. Add cinnamon stick, cloves, bay leaves, peppercorns, star anise, black cardamom, and dried plum and when they start to sizzle (around 10-15 seconds) add onions. Fry the onions till they turn soft and translucent (approximately 10-12 minutes). Add garlic and ginger and saute it with the onions for a minute or so. Add tomatoes, salt, and chili powder and continue frying them till they are soft and mushy, (approximately 10-12 minutes). Add chili powder, garam masala and coconut milk to the Instant Pot. Do a taste test – the salt should slightly be on the higher side. Drain the water from the soaked rice and add the rice on top of the chicken and add just enough water to completely submerge the rice. Open the lid and let the steam escape. Add a tablespoon of ghee and wait for 5 minutes before fluffing the rice and mixing in the ghee. Garnish with coriander leaves and gently mix before serving. Serve hot with raita or yogurt. 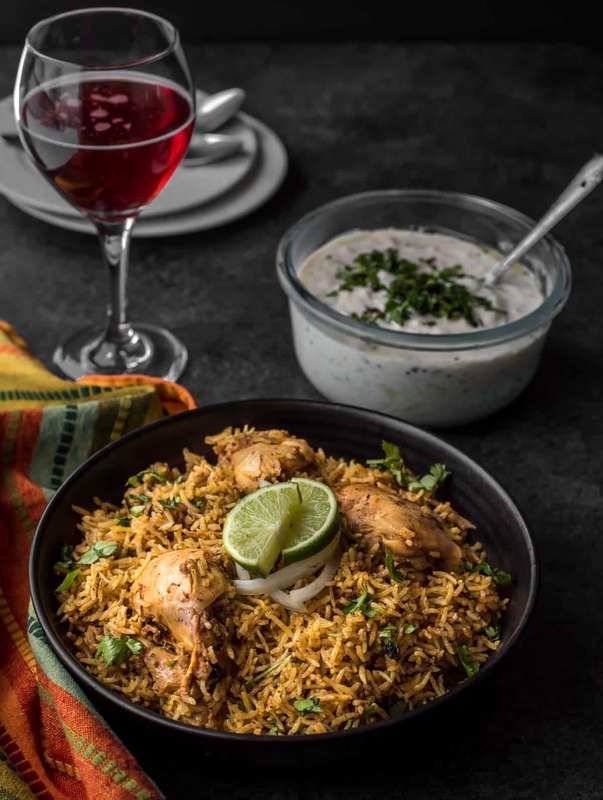 Make this chicken biryani in an Instant Pot today and you’ll never go back to the laborious way of making biryanis again.